In this era, health-care facilities have improved greatly which has increased the life expectancy of humanity, but all the costs and so, the role of economic evaluation of health-care interventions has become increasingly important. Very few studies have been done with regard to the cost of treatment of patients admitted to medical Intensive Care Unit (ICU) of third world countries. In India, the concept of ICU management has come forth in the last 30 years and is yet in its budding stage. People are unaware about their role and importance with respect to critical care, and so a thought of admission at such places is responsible for chaos among caregivers. If effective studies could highlight the expenditure toward the management of life-threatening conditions, then it would be helpful. The medical facilities have improved in India, however, owing to the high expenditure involved; few privileged ones can afford it. To make maximum people utilize these benefits, proper analysis of high cost is to be found out. Owing to the wide spectrum of disease presentation and the availability of vast management (diagnostic and treatment) options the cost varies, making it difficult to estimate the cost of the treatment. A single episode of an ICU admission imparts economic burden, so there is a need to find out the pharmacoeconomics of treatment in the developing countries. Although in developed countries number of studies are done in terms of expenses they differ from the scenario. However, these previous studies can be helpful as guidelines for future studies in the third world countries. The aim of the study was to calculate and further analyze the average cost of management of a patient admitted in medicine ICU (MICU), to know which disease among the common entrants in the ICU is the costliest to treat and the area of maximum expenditure. This is a descriptive epidemiological study which was conducted in a tertiary care hospital with twenty bedded MICU in the private setup of Mumbai region. This ICU is having all modern intensive care equipment such as multiparameter monitor and five ventilators. Specialist medical staff with two full-time intensivists along with a battery of physicians, cardiologist, nephrologist, gastroenterologist, and neurophysician. The staff is well trained in handling medical emergencies. The pathology department is fully equipped with 24 h emergency facility. The radiology department inclusive of computed tomography (CT)-scan, ultrasonography, and X-ray is also 24 h functional. All patients admitted to MICU on the basis of the clinical presentation during January 2014–February 2014 (2 months) were included in the study. All patients who suffered sudden unexplained death were excluded as well as all those who were transferred to higher cardiac center for further intervention such as angioplasty, coronary artery bypass grafting (not available at our institute). All patients who underwent the operative procedure and those who were kept for postoperative management did not form a part of the study. Newly diagnosed cases of hypertension and diabetes were not included. A prospective estimation of the cost in the MICU was made with regards to cost of stay in the ICU (bed-charges), diagnostic cost (cost of investigations [routine], cost of special investigations [two-dimensional (2D) echo, CT scan, magnetic resonance imaging (MRI)], therapeutic cost [cost of therapeutic procedures-catheterization, central venous pressure (CVP) insertion, intubation, etc.] cost of oxygen, monitor, nebulization, ventilator, and cost of drugs and other consumables) was done for fifty patients who were included in the study. These patients were regularly followed till they were transferred to the wards to know about the expenditure. All data were plotted on Excel sheet and analyzed using software SPSS version 16.0. (SPSS Inc., Chicago, US). The numbers of patients admitted were calculated and total days of hospital stay were ascertained. The average length of hospital stay was also calculated. The patient's average cost of stay is calculated by assessing the cost of stay for a particular disease (95% confidence interval). During study duration, total seventy-five patients were admitted to the ICU of which eight patients expired, seven patients underwent operative management, three patients were kept for postoperative management, and seven patients were transferred to a higher cardiac center in view of urgent cardiac intervention. Finally, fifty patients who met the inclusion criteria were included out of which there were 31 male patients and nineteen female counterparts. Bed charges in the hospital ICU were included in hospital indoor charges. Bed-charges also accounted for the nursing care, which includes monitoring of vitals, mouthcare, bed care, all dressings, infusion pumps, and other special care required. It amounted to Rs. 800/day whereby a 24-h check-in facility for calculation purpose was present. A nominal charge of Rs. 50 was taken as admission charge from hospital. Patients are observed in the ward for a day or two, and if they continue to show signs of improvement then they are discharged home and asked for regular follow-up visits with the physician and treatment is continued on an outpatient basis unless exacerbation takes place. Oxygen is provided through a central oxygenation facility, which costs Rs. 400/day. Monitoring of continuous electrocardiogram, saturation and blood pressure monitoring costs Rs. 250/day while nebulization charges are Rs. 250/day and Rs. 1800/day was the charge for ventilator. With evidence-based medicine in vogue, the diagnosis has to be justified, and clinical diagnosis alone no longer holds true, so every patient has to undergo investigations as per the clinical judgment to confirm the diagnosis. Every patient underwent a battery of investigations routine (complete blood count, liver function test, kidney function test, lipid profile, creatinine kinase muscle and brain [CK-MB]) to special investigations such as echo, CT scan, and MRI as per the requirement. For all patients in the ICU, food was provided every second hourly by the hospital as per the guidance of the physician and the dietician. The relatives of the patient as per the treatment modality prescribed bought drugs. This variable varied as per the medical diagnosis, patient response and the timely complications developing. Therapeutic procedures were differed with the presentation of the patient. However, this included-catheterization, CVP line, intubation and intravenous line. In case of myocardial infarction (MI) that constitutes maximum patients (30%) in the study, the routine investigations were same as any other condition reported in the ICU, additional investigations were 2D echo to know the cardiac status in terms of ejection fraction and electrocardiograms with the cardiac enzymes CK-MB (which increased the diagnostic costs). In the treatment modality thrombolysis with costly medicines like injectable streptokinase (Rs. 4000) or injectable urokinase (Rs. 9000) and the need for injectable nicorandil as well as injectable glycoprotein IIa and IIIb inhibitors and low molecular weight, heparin accounted for the high therapeutic costs. Unstable angina (20%) is an admission in ICU more for observation purpose than for therapeutic purpose owing to chest pain. As compared to MI costly treatment modality like thrombolysis is not required. Although frequent electrocardiogram and low molecular weight heparin form a part of diagnosis and treatment, respectively. Congestive cardiac failure (CCF) patients were 12% of the entrants in ICU. Here, high costs could be attributed to the need of therapeutic procedures like CVP line, catheterization besides nebulisation. Arterial blood gas (ABG) is required to assess if respiratory failure is also present. Out of six patients, two required ventilator support owing to the hypoxemic respiratory failure in the setting of pulmonary edema in which they were bought. However, once the fluid was driven out of the body with the help of diuretics and fluid restriction the ventilator support was withdrawn off quickly in comparison to chronic obstructive pulmonary disease (COPD) patients were ventilator has to be removed off slowly requiring longer duration and so high costs in turn. Frequent X-rays are required to judge the degree of congestion. 2D-echo is must in these patients to know about dilated cardiomyopathy, valvular lesion as well as the ejection fraction. The stay of asthma patient in ICU is less. Nebulization is the only important cost additive factor here. Costly investigations, as well as therapeutic procedures, are not required accounting for low costs compared to the other diseases. These patients on the treatment of infection improve very fast and can be quickly taken out of the ICU care. Four patients of organophosphorus poisoning (OP) are included in the study due to common presentation in an agricultural country like India. 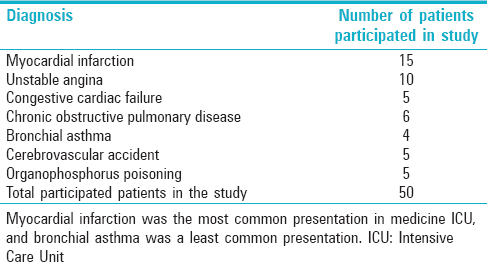 Out of four patients, 3 (75%) did require ventilator for 3–4 days in view of respiratory paralysis and failure contributed mainly to factors such as increased secretions, pulmonary edema, and there is always danger of aspiration pneumonia and secondary chest infection most common being ventilator-associated pneumonia. Out of the three cases of OP poisoning, ventilator-associated pneumonia occurred in one case. Blood investigation-pseudocholinesterase level is a must in these cases to decide removal of ventilator support besides improvement of the patient clinically. Frequent ABG is required to know about the respiratory failure component. The longer stay in ICU and costly antibiotics add to the cost of treatment. COPD patients are usually elderly and require ventilator support; frequent ABG analysis, as well as X-ray are, must along with the nebulization that contribute to the cost. In spite of being respiratory condition, 2D echo along with CVP line are must to know the cardiac status in view of cardiomegaly, right ventricular dilatation to estimate the degree of cor-pulmonale and also to estimate if there is fluid overload due to poor cardiac status. Medications required here are costly which includes broad-spectrum antibiotics, bronchodilators, and corticosteroids. In case of cerebrovascular accident (CVA), it is the requisition of CT-scan which adds up to the investigation charges. Besides the routine treatment, it is the physiotherapy, which is the major modality for cost as well as treatment. Out of five patients, only one underwent MRI-angiography for posterior circulation stroke to know the exact lesion. The study had 31 male patients and 19 female patients who were selected randomly as per the inclusion criteria. The youngest patient was of 22 years and the eldest of 86 years with mean age being 60 years [Figure 1]. The final diagnosis of each patient on discharge card was used to classify the patients. For the purpose of simplification of calculation and better understanding of expenditure on a patient in ICU, they were assigned into seven different diagnostic groups [Table 1]. Duration of ICU stay is highest for OP (6.75 days) to lowest for unstable angina (2.4 days) as shown in [Table 2]. The average stay of a patient in ICU amounts to 4 days (approximated for 4.01) with the least being 1 day for unstable angina and maximum 11 days for CCF [Table 2]. From the point of medication, the costliest to treat is OP (requiring Rs. 26,500) and the least expensive is unstable angina (requiring Rs. 5940) as shown in [Table 3]. The average cost of stay is proportional to the length of stay (LOS) in ICU with it being highest for the OP which has the longest duration of stay in ICU also. Unstable Angina that has a short duration of stay also has the least cost toward it [Table 2]. The amount spent toward diagnosing a condition was highest for CCF (requiring Rs. 9500) followed by CVA (requiring Rs. 7900) and lowest for bronchial asthma (requiring Rs. 3160) as shown in [Figure 2]. MI (n = 15) which was most common presentation in ICU had patients staying for an average of 3.6 days. The average cost of stay was Rs. 3160. The cost for diagnosis was Rs. 5646. The cost for therapy being Rs. 18,137 and it accounted as the costliest factor. The average cost per patient per day was Rs. 7484 and the cost for treatment in ICU of MI patient accounted to an average of Rs. 26,943. The average cost of therapy in ICU per patient was highest for OP patient, and least was in unstable angina. COPD was also very costly to treat being the second most costly condition [Table 3]. Although OP is the most expensive condition however per day expenditure is most for the COPD patient. However, unstable angina in all aspects is the least expensive to treat. The average cost of a stay in ICU per patient amounts to Rs. 3454 (14%) and from this data the average cost of stay per patient per day was calculated to be Rs. 842.4. The average cost of diagnostic tests per patient amounted to Rs. 5981 (21%) and the cost per patient per day amounted to Rs. 1458.7. The average therapeutic cost per patient was Rs. 17,778 (65%) and that per patient per day is 4336. The average total expenditure per patient amounted to Rs. 27,213 and the average cost per day per patient amounted to Rs. 6637.3. The total expenditure of fifty patients in 205 days is Rs. 1,360,650. Increase cost of the treatment due to changing profile of diseases in India. It is important to note the difference in health-care delivery system in India to Western countries due to cultural difference, socioeconomic difference, high turnover of patients, less access to mediclaim and social security scheme. This prospective study was conducted in a tertiary care hospital with twenty bedded MICU in the private setup of Mumbai region. This ICU is having all modern intensive care equipment such as multi-parameter monitor, five ventilators. Specialist medical staff with two full-time intensivists along with a battery of physicians, cardiologist, nephrologist, gastroenterologist and neurophysician. The demographic parameter of the patients admitted to ICU revealed that male admissions in ICU almost 1.5–2 time more as compared to the females. Mean age of the patient admitted to ICU was 60 years in our study. Studies done previously in Bengaluru (2006) and Dehradun (2012) shown similar results regarding age pattern of ICU admissions and percentage of male admissions comparable to our study., Today medical facilities have improved greatly, increasing, in turn, the survival prospects of the patients, but this has added to the hospital MICU costs. Average LOS in MICU was found to be 4.5 ± 1.8 days in our study. In previous studies done in ICUs of North India, South India, Nepal, and the USA, average LOS in ICU was 5.75, 6.22, 4.0, and 5.2 days, respectively.,, The difference found in the mean LOS could be due to the difference in illness and disease pattern among the population of that particular area. The mean length of hospital stay is shorter than western countries as per reported studies. There is very little information on the cost of intensive care from third world countries. The information would be useful for (a) guiding families at the time of admission in ICU about the expenditure (b) exploring effective ways for better utilization of available resources (c) setting up a new ICU. The percentage of the gross national product being spent on the health aspect in India is much less than the requirement, hereby an effort to find out the true requirement is made in terms of expenditure on critical care. The total cost of hospital care is the sum of indirect and direct costs. Direct costs are those that can be billed to the patient, for example, investigations, consumables, and drugs indirect costs are those that cannot be billed directly to the patients, for example, administrative and clerical staff salaries, cost toward material, and supplies of ancillary services. In this study, we have done analysis on the costs revolving around the stay in hospital, investigation as well as the treatment. Cost of stay was found to be highest for organophosphorus poisoning owing to the long duration of stay, followed by CCF but here a mention of a patient who stayed in ICU for 11 days could be a contributing factor and the reason for his long stay was arrhythmia, fracture neck femur besides the age of 80 years who was taken on ventilator. Per day expenditure was highest for COPD due to the use of ventilator support and length of hospital stay in COPD depends on oxygen saturation of the patient. This finding was consistent with one of the previous studies by Ramaraju et al. Among investigation, routine ones were approximately the same and among the special investigations, it was CVA that topped the list as a consequence of the need of CT-scan in all patients. Therapeutic procedure requirement was highest for CCF in view of requirement for CVP line and catheterization. In this study, 65% of the total expenditure was for therapeutic purpose. OP poisoning can be among highest LOS in the ICU, increasing economic burden of the patient and health-care provider. Awareness about health-care facility and cost factor is must among the community, health-care providers so that one can think and arrange the hospital ICU expenditure in future. These results can be used for the study of an alternative treatment to reduce the expenses of hospital stay. One of the previous studies by Ramaraju et al., shown that health-care utilization, especially length of hospital stay and ICU admission for COPD determines overall morbidity, mortality and cost burden. In third world countries, yet the concept of insurance has not reached the masses, and so people have to struggle for monetary arrangement. Limited resources, widespread poverty, and absence of health insurance pose a further problem in third world countries. The maximum numbers of patients admitted were of MI, and they accounted for 30% of the cases in the ICU. The costliest disease to treat in the ICU was COPD with an average expenditure per person per day being Rs. 8825 followed by MI where it was Rs. 7484. In terms of charges of stay, OPs was the most expensive with the average expense per patient being Rs. 5712. In terms of diagnostic investigations most costly was CVA which amounts to Rs. 7900. More studies need to be done in this respect especially in developing countries from where data is inadequate. Similar studies could form the basis for cost reduction studies. More studies should be conducted for cost-effective analysis to know the real perspective in terms of a number of life-years gained. The study was done for a shorter period. Hence, in future, we are planning for the study for 1–2 years with more number of cases. Marten R, McIntyre D, Travassos C, Shishkin S, Longde W, Reddy S, et al. An assessment of progress towards universal health coverage in Brazil, Russia, India, China, and South Africa (BRICS). Lancet 2014;384:2164-71. Kramer AA, Higgins TL, Zimmerman JE. Comparing observed and predicted mortality among ICUs using different prognostic systems: Why do performance assessments differ? Crit Care Med 2015;43:261-9. Thomas K, Peter JV, Christina J, Jagadish AR, Rajan A, Lionel P, et al. Cost-utility in medical intensive care patients. Rationalizing ongoing care and timing of discharge from intensive care. Ann Am Thorac Soc 2015;12:1058-65. Kumar P, Jithesh V, Gupta SK. Does a single specialty Intensive Care Unit make better business sense than a multi-specialty Intensive Care Unit? A costing study in a trauma center in India. Saudi J Anaesth 2015;9:189-94. Chandra H, Pahari S, Kandulna J, Srivastava A, Masih L, Jamaluddin K, et al. Is tertiary care treatment affordable to all? – Explore alternative (s) for healthcare financing. Int J Health Sci (Qassim) 2009;3:197-202. Shelat PR, Kumbar SK. A retrospective analysis of direct medical cost and cost of drug therapy in hospitalized patients at private hospital in Western India. J Clin Diagn Res 2015;9:FC09-12. Riewpaiboon A, Malaroje S, Kongsawatt S. Effect of costing methods on unit cost of hospital medical services. Trop Med Int Health 2007;12:554-63. Tan SS, Bakker J, Hoogendoorn ME, Kapila A, Martin J, Pezzi A, et al. Direct cost analysis of Intensive Care Unit stay in four European countries: Applying a standardized costing methodology. Value Health 2012;15:81-6. John LJ, Devi P, John J, Guido S. Drug utilization study of antimicrobial agents in medical Intensive Care Unit of a tertuart care hospital. Asian J Pharm Clin Res 2011;4:81-4. Amit GS. Drug use evaluation study in a tertiary care corporate hospital with special reference to use of antibiotics in ICU department. Int J Adv Pharm Biol Chem 2013;2:179-89. Kulkarni AP, Divatia JV. A prospective audit of costs of intensive care in cancer patients in India. Indian J Crit Care Med 2013;17:292-7. Biswal S, Mishra P, Malhotra S, Puri GD, Pandhi P. Drug utilization pattern in the Intensive Care Unit of a tertiary care hospital. J Clin Pharmacol 2006;46:945-51. Jayaram R, Ramakrishnan N. Reimbursement for critical care services in India. Indian J Crit Care Med 2013;17:1-9. Jayaram R, Ramakrishnan N. Cost of intensive care in India. Indian J Crit Care Med 2008;12:55-61. Ramaraju K, Kaza AM, Balasubramanian N, Chandrasekaran S. Predicting healthcare utilization by patients admitted for COPD exacerbation. J Clin Diagn Res 2016;10:OC13-7. Virk AK, Atun R. Towards universal health coverage in India: A historical examination of the genesis of Rashtriya Swasthya Bima Yojana – The health insurance scheme for low-income groups. Public Health 2015;129:810-7. Prinja S, Chauhan AS, Angell B, Gupta I, Jan S. A Systematic review of the state of economic evaluation for health care in India. Appl Health Econ Health Policy 2015;13:595-613. Khandelwal N, Benkeser DC, Coe NB, Curtis JR. Potential influence of advance care planning and palliative care consultation on ICU costs for patients with chronic and serious illness. Crit Care Med 2016;44:1474-81. Mathew P. Generic drugs: Review and experiences from South India. J Family Med Prim Care 2015;4:319-23. Siner JM, Connors GR. Protocol-based care versus individualized management of patients in the Intensive Care Unit. Semin Respir Crit Care Med 2015;36:870-7.